In recent years Chainikov has emerged as Russian Realism's newest and brightest find. His recent death at the age of 47 is a great loss to Russia, and to the international art world. Chainikov embraced Russian Realism and remained ever true to its spirit. As he explained, "My themes arise on their own, through insight and not from engaging in subtleties.." His landscapes are often filled with human forms. He painted the everyday: peasants, the field workers, the old, and the young. He painted only what matters, only what is real. In the pater years of his life, one could most often find the non-assuming Chainikov at The Academic Dacha, painting Russia's humblest fold, with the compassion and understanding of an artist who knows only how to paint the truth and the realism of life. When contemplating the paintings created by Grigoriy Leontievich Chainikov, one is struck by the purity and simplicity of the artist's subject matter. Chainikov's work radiates kindness, sincerity and serenity. The art mirrors the painter's personality: engaging, humble and genuine. An artist's view of the world can dismiss abstract reasoning and meaningless rhetoric. Trained in the traditions of Russian Realism, Chainikov sees man and nature as the wellspring of his inspiration, as he uses intricate combinations of color and shade to frame a moment in time. For Chainikov, fantasy and abstract are tricks of the "evil one. Chainikov's origin can be traced to Udmurtia, Russia, where his ancestors had resided for generations. The artist was born on November 28, 1960 in the remote village of Grakhovo. Chainikov, a self-taught sketcher, often spent the tedious summer hours he worked as a shepherd, drawing images of the countryside. Before long this hobby became an obsession and Chainikov entered The Department of Graphic Arts School, housed in a classical, ancient mansion. The formal majesty of artistic academia inspired Chainikov. Here Chainikov studied the plaster head of Apollo, amazed by the artist's ability to convey image in dimension. This became the defining element in Chainikov's style. His teachers soon recognized the student's extraordinary raw talent. Chainikov was a prodigious worker. 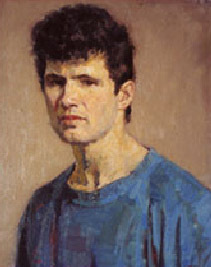 Initially Chainikov painted only with watercolors, but he was soon referred to Moscow to study under Victor G. Tsyplakov, the renowned "people's artist of the USSR", where he quickly turned his skills to painting strictly with oils. Chainikov was ultimately admitted to the Surikov Institute of Arts, the most prestigious art institute of Russia. Much of Chainikov's development came under the watchful eye of Tsyplakov who taught his student to paint directly on the canvas, without sketches. For instance, the teacher had his student begin a portrait by painting only the eyes, then developing the painting around the origin. Tsyplakov and Chainikov became fast friends, as well as teacher/student. Upon completing his training at The Instutitue, Chainikov went to the Russian Academy of Arts, painting alongside two of Russia's most honored artists, brothers, Alexi and Sergei Tkachev. Gaining admission to the Artist's "Akademicheskaya Dacha" enabled Tkachevs the opportunity to study the younger Chainikov's works. The brothers were teachers and mentors to Chainikov, and were instrumental to the success of their friend and student over the years.